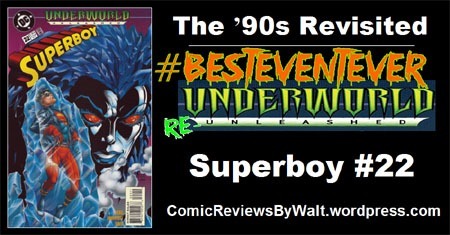 The ’90s Revisited: Superman the Man of Tomorrow #3 – Underworld Unleashed! Now this is more like it! This is the sort of thing I expected of Underworld Unleashed tie-ins! Then again, looking back across the 20+ years…the Superman tie-ins very likely were the only ones that I actually would have read, as I was in a downswing toward a 13-14 month period of getting very few comics! This issue is "triangle-numbered" 1995/50…that is, it’s the 50th issue of any of the main Superman titles with a 1995 cover date. This is from that time where the titles functioned as a weekly thing, with each leading into the next with very tight continuity! In fact, this title itself was created (as I’m recalling it) to cover "fifth weeks," so that there WOULD be a new SUPERMAN comic every single week of the year! We begin the issue on Earth, with Lois Lane meeting with Contessa (at this time the current head of Lexcorp) and discussing recent events; basically exposition for those of us just joining in. Superman’s been kidnapped into space, the Alpha Centurion gathered the rest of "Team Superman" (Supergirl, Superboy, Steel) to go after him, something about the Eradicator, and hints at other subplotty stuff with people romantically linking the Centurion to Lois herself. The scene then moves to Sorcerer’s World, where we find Superman fighting an invisible and mostly-intangible entity. It seems he’s been "shot down" onto the world, along with a new friend–"Mope" or "The Mope"–they were arriving peacefully, seeking to clear Mope’s name so he would be free of "The Tribunal." While Superman defeats the entity and claims its cape, we find Mope prisoner of a sorcerer who is determined to find out why Mope is here! Meanwhile…in the Underworld, Neron sits on his throne and enjoys gloating over a snowglobe with two figures held prisoner within–The Joker! And Lex Luthor! 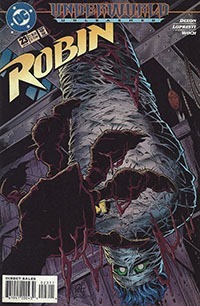 Luthor reflects on the events that have brought him here, the "flashback" showing us his deal with Neron and how he’s gone from being a mind trapped in a frail, shriveled clone to being a fit man at his prime–and some details contextually from Underworld Unleashed itself–the main mini-series. 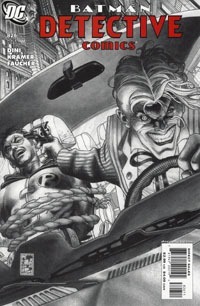 That he is stuck with The Joker offers him his own personal hell. Then the whole place bursts apart! Meanwhile (again), Superman rescues Mope and they convince the sorcerer of their non-invasive intentions, and get sent to where they can find the person they’re after. As this is going on, Luthor and Joker find themselves in some surreal void and ultimately separated, and Luthor "lands" on Earth. He reflects further on the situation–is he truly free of Neron, and how he lucked out keeping this healthy body…and he seems to settle his questions of having or not having a soul with the idea that if he DID have a soul, he’d surely lost it prior to Neron anyway. Hitchiking a ride, he heads into the nearest city to get back to humanity. 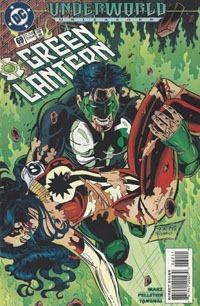 Closing out the issue, the Tribunal has a new agent who is glad to hunt down Superman for them–The Cyborg! And Superman and Mope find themselves trapped on the other end of the portal they were sent through, facing a new situation that’ll pick up in another issue of another title. 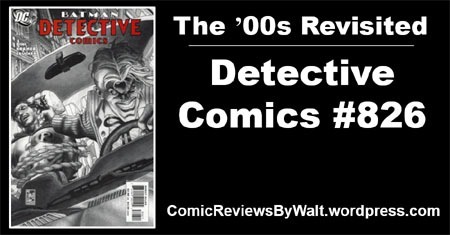 As much as I complain about modern 2018 comics and the constant cycle of events…I’d nearly forgotten the overlap of events in the ’90s. Or if not events as I think of them in 2018, then titled storylines/crossovers where an issue is part of two different larger stories. This very issue is the immediate example, as it is both a chapter of the larger The Trial of Superman! 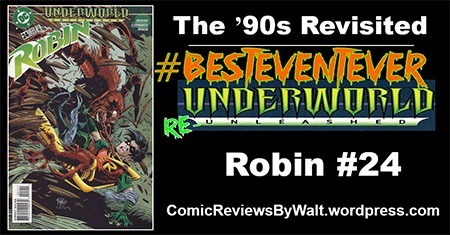 and also part of Underworld Unleashed! at the same time. 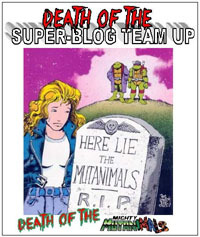 I’m also thinking of the 1994 story The Fall of Metropolis where at least one issue was part of that and simultaneously part of the Worlds Collide event/crossover between the DC Universe and the Milestone universe. I don’t remember particularly minding this back then, and now in 2018 I’m good with this issue being part of two stories because The Trial of Superman! 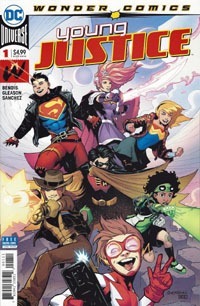 is basically a crossover, or given the "weekly" nature of the combined Superman titles, "just" a titled story wholly contained with no special issues, one-shots or external tie-in issues. 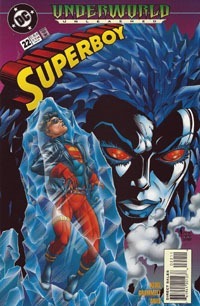 And with the issue’s participation in Underworld Unleashed, it represents there not being a separate special, one-shot, or tie-in mini-series on top of the already weekly Superman saga. 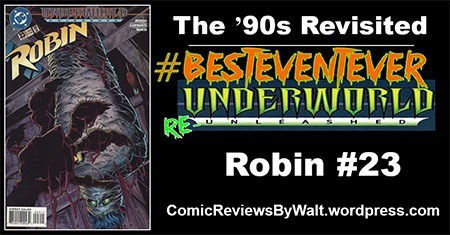 Underworld Unleashed was an event affecting the DC Universe, and here we see it affecting the DC Universe! 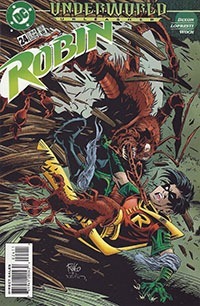 I really enjoyed this issue, overall…a large part of that is the art from Grummett and Breeding; I’m re-realizing lately just how much I truly enjoy Grummett‘s work! Superman himself looks a bit "off" without his cape, but I’m pretty sure I he lost it in a different chapter of this story, so that speaks to the quality editing and continuity; and this was from a period where the cape was not a singular, permanent piece of a singular costume, but something that could and would be damaged and occasionally lost. I far prefer the character with the cape, but as part of an ongoing story where he doesn’t have time or inclination TO replace it, the visual speaks volumes that don’t even have to be referenced in text or dialogue. The alien characters look suitably odd to me, and I really like the way Luthor looks here, and even the Joker has a certain ’90s look and feel where he’s dangerous but one can easily drop their guard on that with the act he puts on. Seeing him frolic around the snowglobe actually made me chuckle, and I could just feel Luthor’s boiling anger at him when hit with a snowball of all things! Story-wise, this issue progresses two things: 1. the ongoing Trial of Superman story following Superman himself and his ordeal involving escape from the Tribunal and helping his new friend clear his own name and 2. 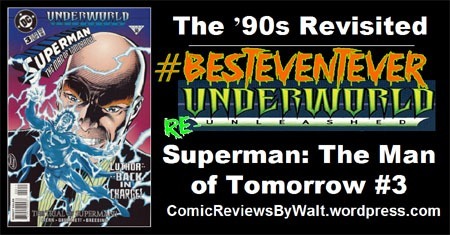 Underworld Unleashed by way of seeing Luthor’s deal and the result, even getting some context of the event series itself along with notes-from-the-editor on issues to check out for full details that refer us both to the event series and another Superman issue. 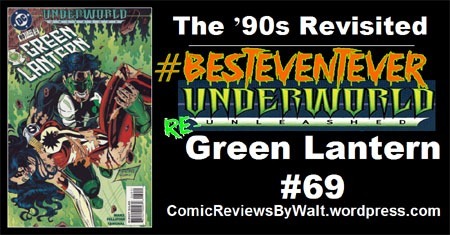 But we get plenty right here in this issue such that we don’t NEED to read Underworld Unleashed itself…we’d just get a lot more context and fuller appreciation for doing so! 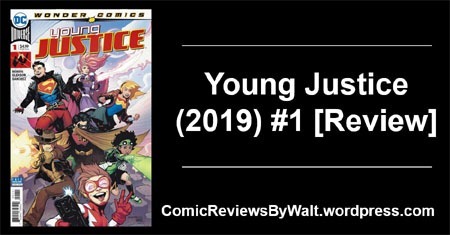 While I’ve already covered Green Lantern #68 and Batman #525 that both tied in to the event…this is the first issue I’ve gotten to that actually has an actual, obvious direct connection to the event itself and truly reference it. While it’s obvious that this issue is impacted by the main mini-series of the event, even if a reader doesn’t get to that at all, one is able to share all the more in Luthor’s perspective of knowing something happened but not being "in the know" as to what, exactly. That allows this to stand alone as well as it does. That it references the mini and draws from it very much justifies the "logoed branding" of this issue as part of the event, in a way that other issues have not. 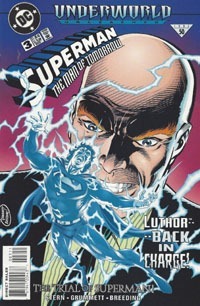 I think my main complaint for the issue is rather surfacey–the cover is highly misleading, showing Luthor gloating over Superman being electrocuted; something that doesn’t at all happen here. Yet, as a figurative thing, it does allow for the caption "Luthor–Back in CHARGE!" Further with that, given Luthor’s history in the post-Crisis DC Universe, this issue is quite significant for the character! Taken by itself as a single, isolated issue, this is not bad, and does definitively show us how Luthor so quickly got back on his feet, healthy and whole and all that, after the events of The Fall of Metropolis. While this is an issue #3, is a "middle" chapter of The Trial of Superman!, is a part of Underworld Unleashed, I feel that one can appreciate it well enough for the Luthor stuff on its own…making the issue something quite justifiable for an isolated, single-issue bargain-bin purchase!